Beat cream cheese and ½ cup of the sugar in a large bowl with an electric mixer on medium speed until well blended. Add egg whites and lemon peel; mix well. In a separate bowl, mix 1 cup of the flour and the baking soda. Spray 9 inch pan with cooking spray; spread batter onto the bottom and 1 inch up side of pan. Toss 1 and ½ cups of pineapple and 1 cup of strawberries with remaining ¼ cup sugar and remaining 2 tsp of flour. Spoon over batter. Bake for 40 minutes or until toothpick comes out clean. Cool for 10 minutes before removing from pan. 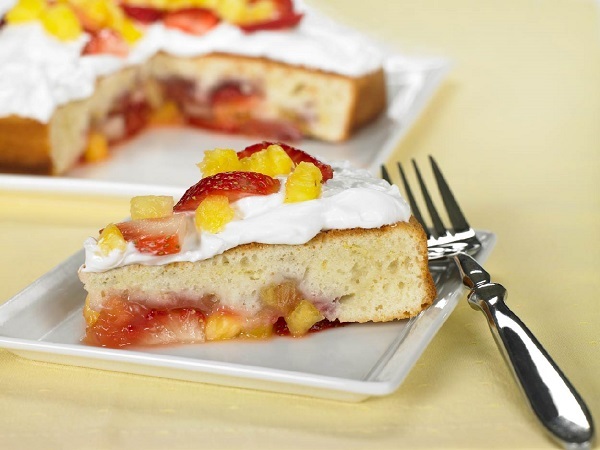 Top with remaining fruit and whipped cream.